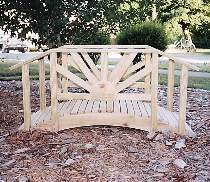 This decorative yard bridge measures 40"L, perfect for the garden or lawn. Inexpensive to make from standard lumber sizes. Patterns drawn FULL SIZE.